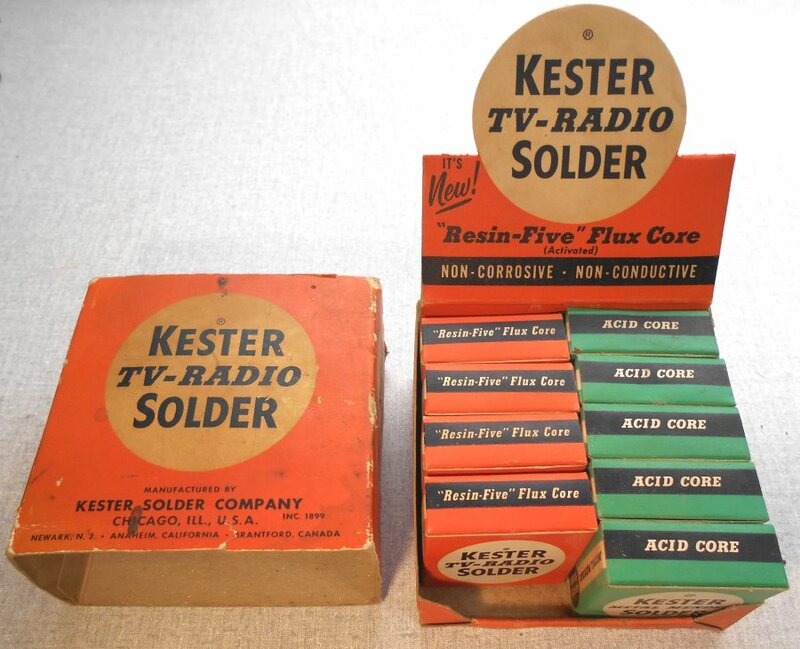 Kester was founded in 1899 as the Chicago Solder Company and manufactured flux-cored solder. 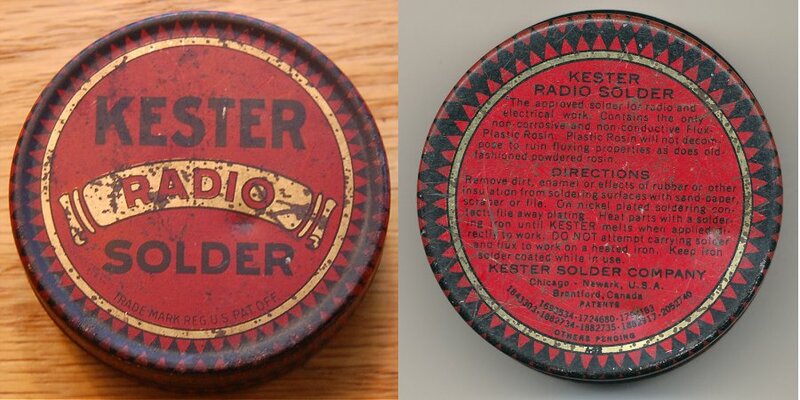 The Kester manufacturing process had a major impact in the radio and electronics industry. 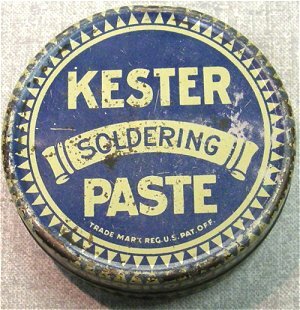 Kester opened manufacturing facilities in Brantford, Ontario, Canada in 1931 and Anaheim, California in 1959. 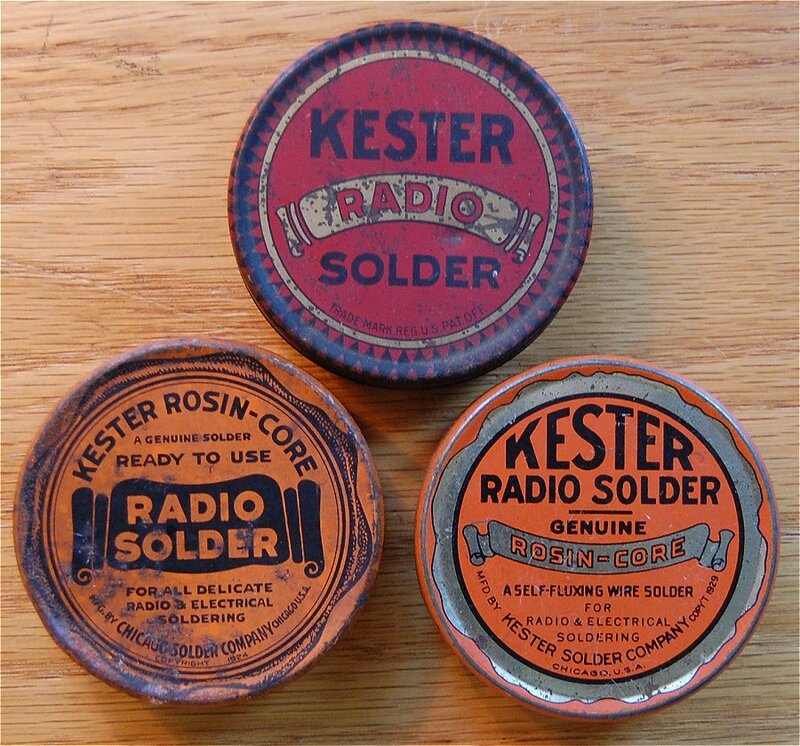 These early tins held Rosin-Core solder for radio work. Directions are on the back of each tin. The last patent date listed on them is 1936. The tins are 2 5/8" diameter by 7/8" deep. 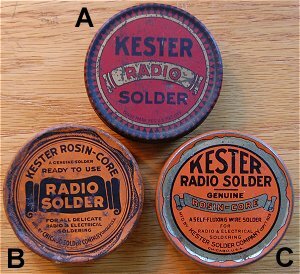 The original rosin core solder contained in the solder tins above is actually flat with raised lettering. 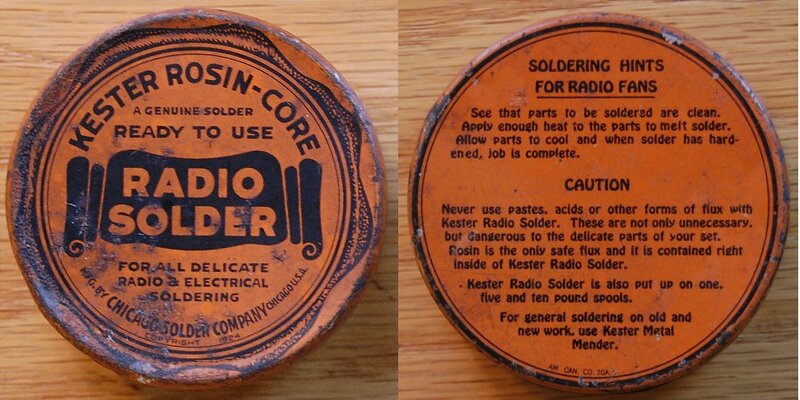 The lettering on the solder reads "KESTER RADIO SOLDER (ROSIN - CORE) CHICAGO SOLDER CO.". 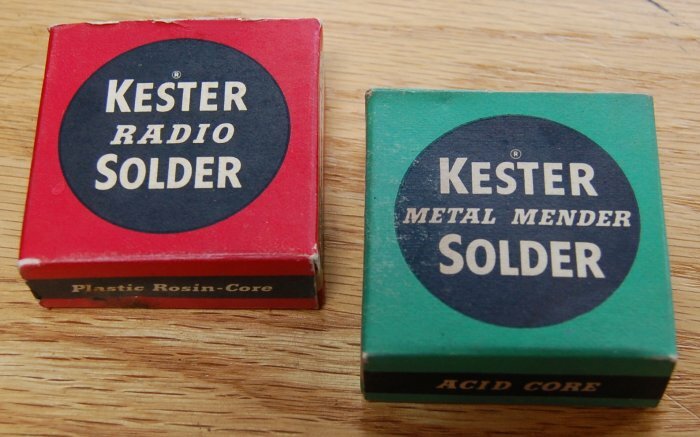 These small boxes of Kester solder were included in many vintage soldering gun kits in the late 1950s and early 1960s. The red box is used for electrical soldering (Rosin-Core), and the green box (Acid-Core) for joining metal or plumbing. 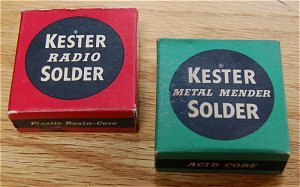 Kester solder counter top display box. 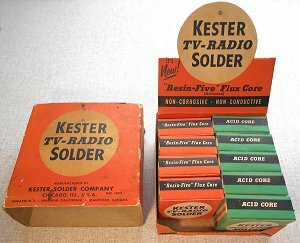 Display contains five each of Rosin-Core and Acid-Core boxes of solder. 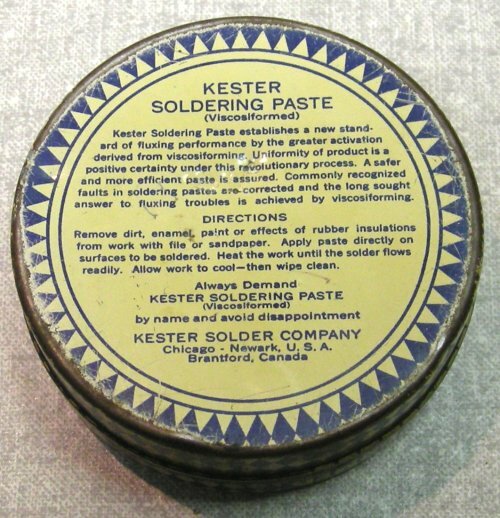 Kester soldering Paste was applied to clean surfaces before soldering to allow a smoother flow of solder. Paste was generally used on plumbing or sometimes on larger elctrical connections to help with heat transfer. 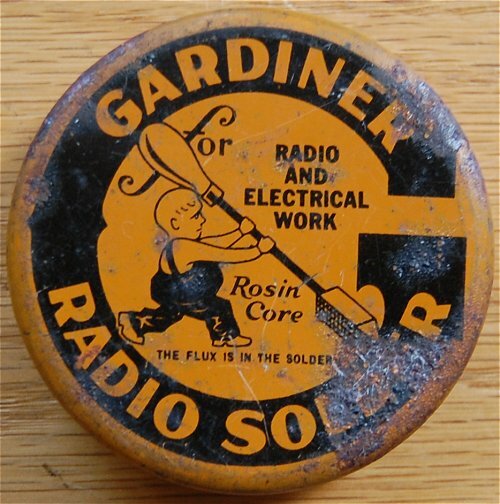 This Gardiner Radio Solder Tin appears to be from the 1920s. Note the pre electric soldering iron pictured on the top. Directions are on the back of the tin. 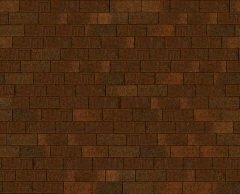 Tin is 2¼"x7/8". 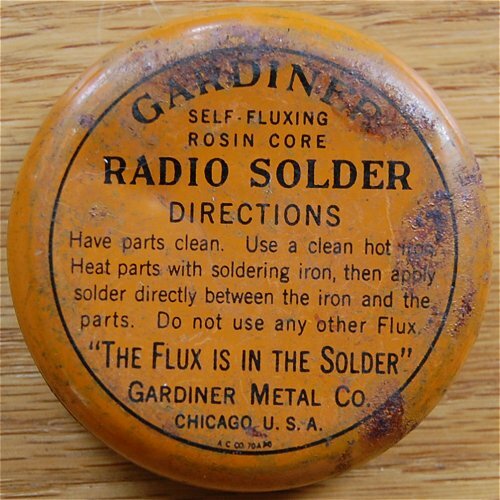 The solder the tin contains is flat and has "THE GARDINER METAL CO. ROSIN CORE SOLDER" in raised letters. 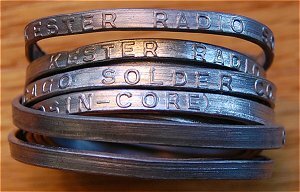 Glaser Radio Solder Tin. Most likely around mid 1930s. Instructions on bottom of tin. 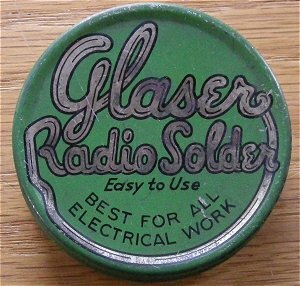 Glaser Lead Company Inc., Brooklyn New York. This is a Tri-Core radio solder tin. 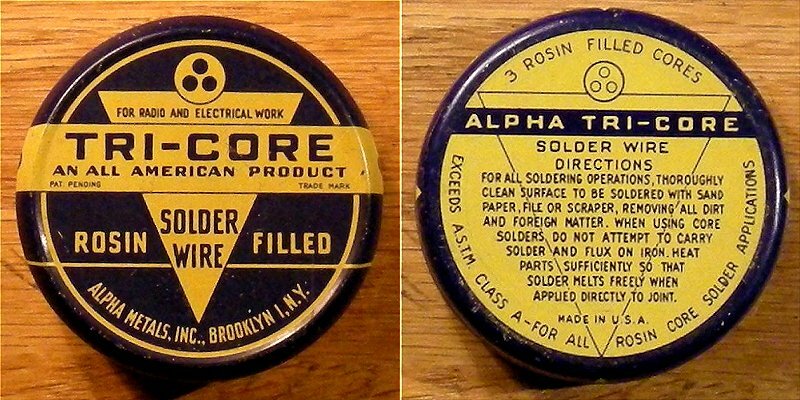 Tri-Core solder was sold for radio and electrical use by Alpha Metals Inc., Brooklyn I, N.Y. Solder wire directions are on the bottom of the tin. Note: The "I" after Brooklyn denotes the number 1 postal zone of Brooklyn prior to the use of ZIP codes. One or two digit zone numbers were used in larger cities from 1943 through mid-1963, originally to aid mail sorting by less-experienced substitute employees during WWII. 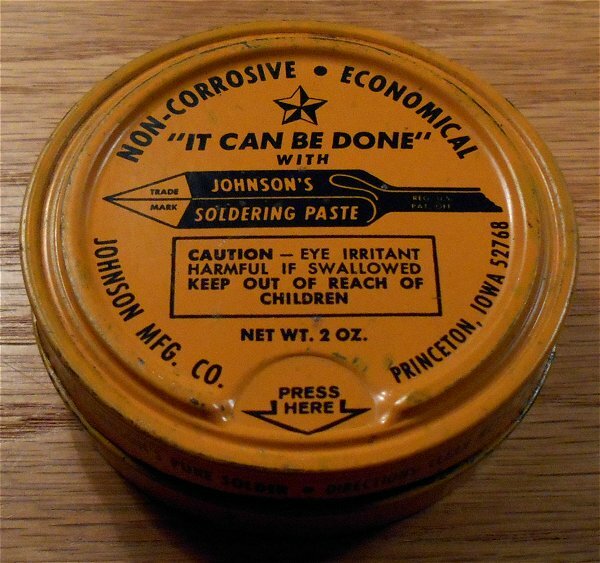 Johnson's soldering paste tin. Instructions are on side of tin. "Clean metal. Apply Paste. Heat. 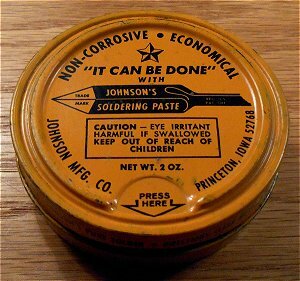 Add Solder, Preferably Johnson's Pure Solder." FYI - no relation to me. 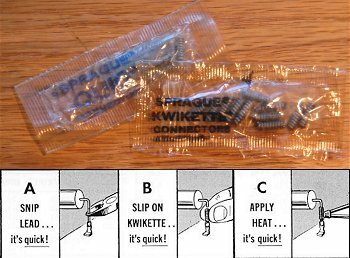 Kwickettes were handy little pre-made coils of wire surrounded with flux and solder. 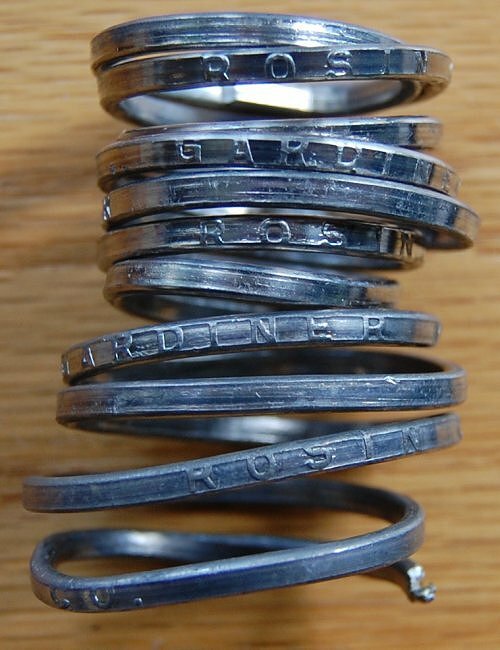 They were used to easily hold replacement resistors, capacitors, etc. on a circuit board using remains of the old components leads without having to remove all of it from the board and avoid applying heat to the trace. See the ad for instructions. 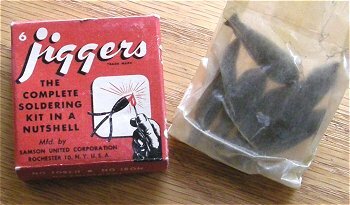 I seldom used them as if I had to, I would wrap a piece of solid wire around a lead to form a coil and then just add my own solder. 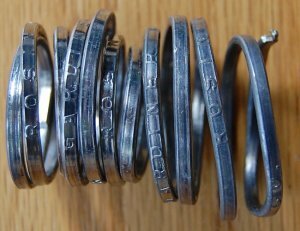 The photo also shows a package of earlier "Quigs". 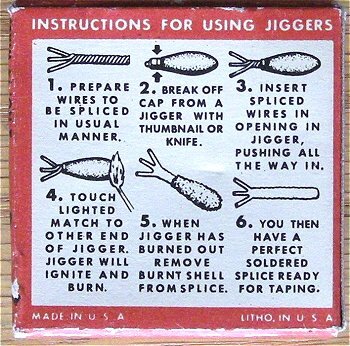 Jiggers were used to to solder wires together using only a Jigger and a match. Twist the striped wires together and slide a Jigger over the bare wires. Light the end of the Jigger with a match. After the jigger burns just pull off the burnt shell and the wires are soldered together. Note: When using an iron or gun the temperature does not get high enough to vaporize the lead in the solder, only the flux. When using a match, the temperature is high enough to vaporize the solder and can cause toxic lead fumes to be inhaled. 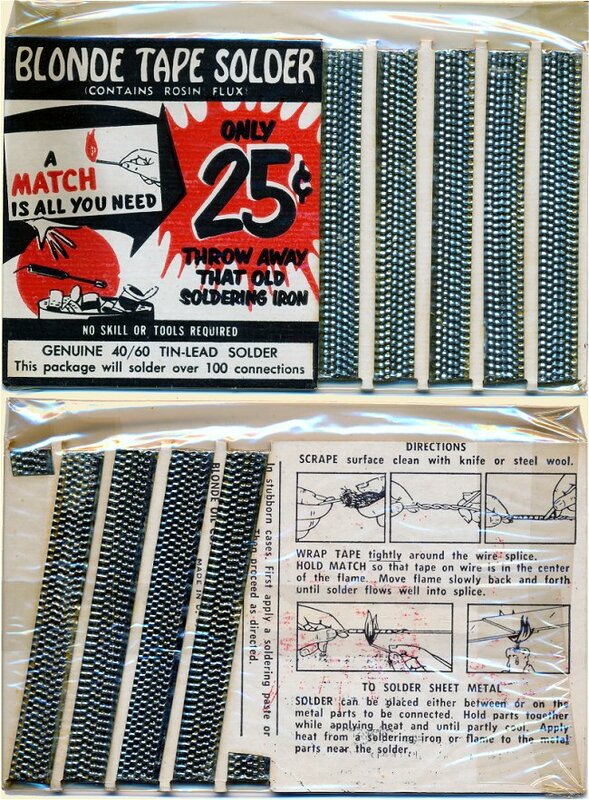 Tape Solder was used to to solder wires together using only a match. 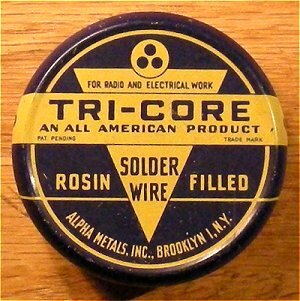 Twist the striped wires together and wrap tape solder over the bare wires. 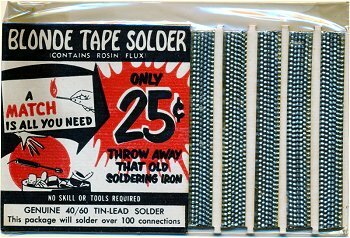 Then melt the tape solder with a match.